Arena Financing Multiple Sources including the Devils for $100 Million, redevelopment around a new arena, $311.5 million public funds, according to the Newark Star-Ledger. Naming Rights Prudential Financial purchased the naming rights in January 2007 for $105.3 million over 20 years. 2013-2014 - Attendance includes one game at Yankee Stadium. Newark, NJ (February 2, 2005) Officials from both the city of Newark and the New Jersey Devils, as well as representatives from the architectural firm of Morris Adjmi, today unveiled the design for the long-awaited Newark/New Jersey Devils Arena. The facility is being planned as the centerpiece of the city's Downtown Core Redevelopment Project. The presentation which was hosted by Mayor Sharpe James and Devils' Chairman/ Managing Partner Jeff Vanderbeek, was held at the New Jersey Performing Arts Center. "Today is a great day for the City of Newark," said James. "We are seeing for the first time the goal of our dreams the creation of a state-of-the-art sports and entertainment arena that will be the central power that spreads prosperity into every neighborhood and home in our city. We are putting Newark on the world stage and it will be the world's star performer." "Today's events are another step in the process of building a first-class 21st century facility for our fans, added Vanderbeek. Everyone affiliated with this project is looking forward to the day when we open the arena doors and bring championship hockey to the city of Newark." Newark City Business Administrator Richard Monteilh served as master of ceremonies and presented the project overview of the Newark Downtown Core District. The highlight of the event was the unveiling of the arena model, including a video presentation of the arena design concept. The event was sponsored by the Prudential Foundation. Morris Adjmi was one of three architectural firms that created models of the exterior and public spaces for the proposed 17,000-plus seat, 700,000 square-foot arena. The original three proposals were presented on October 21, 2004. The final design featuring large brick columns and an aluminum curtain wall, was selected by the Executive Committee. Morris Adjmi Architects of New York City, has a history of design achievements that include the Walt Disney Company's Office Complex in Celebration, Florida, and the New York City headquarters of Scholastic, Inc.
Adjmi will work with HOK Sport+Venue+Event, a Kansas City-based design firm, to create the final plan for the arena. HOK, a specialist in sports venue design, has already been chosen to design the interior spaces of the arena. The Newark Housing Authority, under Executive Director Harold Lucas, will oversee the project. Lucas, who served as city Business Administrator and Federal Undersecretary of Public and Indian Housing for the Clinton Administration, earned national acclaim for his overhaul of the city's public housing stock, turning it from "worst to first" in the United States. A New Jersey court has approved a financing plan being used to fund construction of a new arena in Newark for the Devils. A group of local residents had taken the matter to court and say they will appeal the ruling. The plan used money from a new lease of the city's airport to fund the arena. The lease money was paid to the Newark Housing Authority and opponents objected to that maneuver because it blocked any possible referendum. Under New Jersey law, citizens can force a referendum on budget expenditures. The judge said a state law also allows the city to do what is "necessary or convenient" to allow such projects to proceed. Can You Smell What The Rock Is Cooking? Sorry, New Jersey Devils fans. You no longer have an excuse to fail to fill up your arena for home games. At least not as of Saturday evening, when the beautiful Prudential Center opens its doors to the hockey-loving public for the first time. I’ll be the first to admit the Meadowlands aren’t exactly the fabled Elysian Fields (the Greek paradise kind, not the baseball field in Hoboken). Let’s be honest: it’s a series of ugly venues (Continental Airlines Arena, Giants Stadium) in an ugly area (acres of stinking, fetid swamps) nestled in an ugly part of the country (the vast industrial fields surrounding the NJ Turnpike Corridor from about Exits 12 through 18). Worse still, the Turnpike is the only major transportation artery of any kind to come within a reasonable distance of the complex, meaning those who enjoy using public transit to get to games are more or less out of luck. If you’re not driving in or getting bused in, you’re not getting there. 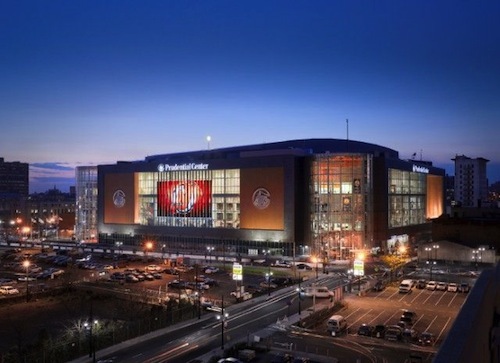 So to sum things up, the Prudential Center (below) is everything that Continental Airlines Arena (above) wasn’t. That’s right: Devils fans are experiencing an overnight transition from having one of the ugliest, least accessable arenas in the league to having one of the nicest, most accessable venues. To get to the Rock, you can take your pick of NJ Transit rail, PATH rail, Amtrak rail, I-280, I-78, National Routes 1 and 9, State Routes 21 and 22, or the Garden State Parkway. Credentials? Yeah, it’s got credentials. The arena was designed by the prestigious HOK Sport firm, which is responsible for some of the finest examples of sports architecture in the world, including virtually all of the best modern baseball stadiums in North America (Baltimore’s Camden Yards, Philly’s Citizen Bank Park, Pittsburgh’s PNC Park, San Francisco’s AT&T Park, and Houston’s Minute Maid Park, just to name a few), a smattering of impressive hockey/basketball arenas of the same mold (Denver’s Pepsi Center, Toronto’s Air Canada Center, Minnesota’s Xcel Energy Center), and countless others. Amenities include an externally-mounted 4,800-square foot LED screen (one of the largest in the world), a new 2,600-foot team store, 750 flat-screen televisions spread throughout the arena, seperate concourses for the lower and upper levels, four LED ribbons extending the length of the rink, an eight-sided scoreboard with high-def video screens, a 350-seat restaurant, three bars, plus the biggest luxury boxes of any arena in North America (76 of them). And did I mention it’s one of only two NHL arenas with a practice facility attached? Let’s face it, Devils fans. You’d better fill this thing up to the brim for every game. Even if your team does lay a goose egg like it did last night. Sure, New Jersey was handed a 2-0 shutout loss by the Rangers last night, but I have a feeling both teams were fairly pleased with what could be interpreted as the lesser of two evils. The Devils lost, but Marty Brodeur finally halted his recent string of miserable performances by stopping 29 shots. The Rangers didn’t get the offensive explosion they’ve been looking for (Nigel Dawes, he of 12 career NHL games, scored both goals), but they stopped the bleeding and earned a win. Both teams are now 3-5-1, which is the kind of early record which could just as easily end in something like a 46-32-4 as something like a 33-43-8. So we’ll see. We’ll also see if the Devils can sell out their building tomorrow. I want to see 17,625 butts in those seats on a nightly basis, especially when there are other, much more passionate fan bases out there who would give minor body parts for as nice a place to watch a game. January 8, 2008 - Plans for a new arena for the New Jersey Devils have been tossed around for years now – there was once a concept to build a new arena in Hoboken. Then came the idea to just do a massive renovation of Continental Airlines Arena, which would be the centerpiece of the mixed-use Xanadu project at the Meadowlands. Eventually they settled on Newark, right in the middle of downtown, amidst gleaming skyscrapers, bedraggled city streets and oceans of government buildings. The Devils contributed $100-million to the construction of their new arena, with the rest coming from the city, via lease fees from the Newark Airport and the Port Authority. 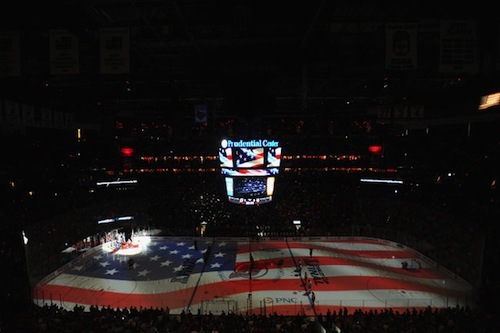 By October of 2007, the New Jersey Devils had themselves a new place to call home. Transportation by car is pretty easy – I-280 cuts through Newark to the north of downtown, while I-78 bisects a couple miles south. Take Route 21 into the city from either direction and follow the signs which will take you right to the arena. The Garden State parkway runs north and south, exit at MLB Blvd. Public transportation is also a good option, with Newark Penn Station just two blocks away, PATH trains go to several points in New Jersey as well as to Manhattan. NJ Transit offers light rail service with a stop close to the arena. Parking around the arena runs $25 or $20 depending on the lot and there aren’t many cheaper options available at a farther distance. Some on street parking is available for free but pay careful attention to the prohibition signs as different streets post different days for no parking restrictions. Also be mindful of the neighborhoods as things are a bit rough in spots. One can also buy prepaid parking passes, linked through the Devils website and park in color coded lots. Again $25 plus service charges is the norm - pricey stuff. A lot has been made of the gritty and rough and tumble streets of downtown Newark, and to a point that is a correct assessment. From a distance one sees shimmering skyscrapers, lit up at night, but travel the streets and it’s all a bit dreary and grimy. By contrast, the new Prudential Center shines like a bright new penny. The main streets just west of the arena are full of the hustle and bustle of office and retail and government. Look closely and the stores are not Apple and Urban Outfitters, but rather creaky bodegas and Furniture Liquidators and such. Bars on windows and vacant storefronts abound. If you look hard enough though, you’ll find some nice corner taverns for postgame hangouts. We stumbled on the Arena Bar, one block down Mulberry Street, a Cheers type place with plenty of plasma screens. Go east beyond the massive Penn Station and you will find a cool ethnic neighborhood called “Ironbound” with a Portuguese flair. Lots of restaurants, shops, little bistros in a much cleaner and safer looking environment. Looked like a cool place to explore, but it’s more of a drive than a walk from the arena itself. There is a substantial police presence outside the arena, and they are going the extra mile to make patrons feel safe. The exterior of the building is a mix of red brick and glass, paying heritage to this region’s bricklaying and railroad heritage, with the most stunning side facing eastward on Mulberry Street. Two tall glassed cupola entrance cylinders mark each corner, and they glow brightly at night. The centerpiece of the façade along this side is a massive dot matrix LED video board which displays cool graphics and can be seen from miles away. While this side of the arena forms the venue’s signature, the two back sides of the building are very basic and ordinary. That lack of detail is somewhat unfortunate since the back end of the building faces the main part of the downtown core. Your seating bowl here comprises four decks, with the upper deck further divided into an upper and lower area. Two levels of suites ring the sidelines, with premium restaurants overlooking the playing surface at this level at each end zone. Seats are colored dark red. Two rings of LED ribbon boards wrap around the seating bowl, and the stacked 8 sided video board is equipped with high definition screens. With bright lighting, grey and white terrazzo tile flooring, and endless displays and things to view, the concourses here at The Rock are a pleasant touring experience. Fans enter at street level through the entrance cylinders and escalators to take you to the main level. Most concession stands are set back from the traffic areas in food court style, lessening congestion. The lower concourse is replete with displays of all the high school hockey team jerseys in New Jersey, extensive artwork and murals showcasing attractions from the region and celebrating icons from the Devils and Seton Hall University. One corner displays the franchise’s history going back to Kansas City and Colorado, with murals of past arenas and old jerseys of the team. One more note is the ample supply of high tech video advertising/message boards scattered throughout the corridors here. Food items here are about as unique and diverse as you want to get in any sports venue. Yes the standard fare can be found at 7 City Grill and Famous Famiglia Pizza. But keep walking and you’ll find a group of stands called “A Taste of Newark” in the upper deck. That’s where you’ll find the good local stuff – Jimmy Buff’s hot dogs, which are topped with fried onions, hot and sweet peppers, and yes, home fries. Right next door is the Newark Deli offering hot pastrami or roast turkey with Russian dressing. Move on and you’ll find the gyros, kabobs and falafels and they cut the meat right in front of you. Finally, the stand from Portugal, something you will only find here in Newark. On the menu? Bifana (a pork steak sandwich), Bolos de Bocalhou (codfish cakes) and Picadinho (pork cubes and potatoes). We also came across a stand selling fine cigars and accessories, and even a guy there hand rolling the cigars right in front of us. Another stand with hot panini sandwiches, a labeled sushi stand but look closely and the fare was Chinese not Japanese, Habana Grill offering Cuban sandwiches, and On the Boardwalk with cheesesteak sandwiches and freshly squeezed lemonade. Team merchandise shops are in abundance at all levels, with the main team store at street level on the Mulberry side of the arena. One deduction though – the concession menu panels are tiny and dark; one has to practically be at the counter to see the offerings and prices. The Devils have retired numbers for two of their players, #3 Ken Daneyko and #44 Scott Stevens. The team’s divisional and conference achievements are grouped in one end zone, while their three Stanley Cup banners (1995, 2000, and 2003) hang at the other end. Additionally, Seton Hall displays a couple banners of their NCAA appearances. Club seating here is located on the lowest level of the seating bowl on the sidelines. 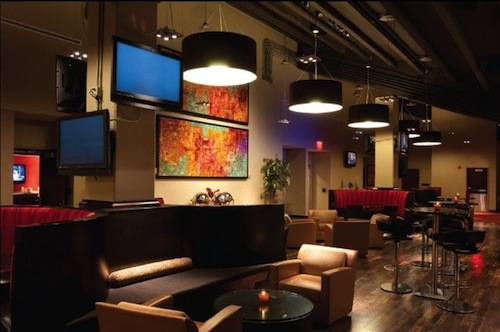 Fans sitting there have access to two exclusive lounges and bar areas titled the “Fire Lounge” and “Ice Lounge”. Two levels of suites ring the seating bowl. The first suite level has some very nice amenities located at each end zone. At one end is the “Bud Light Goal Bar” and loft style bar area with rail seating views of the action, while at the other end is the arena restaurant, offering a la carte and buffet dining, also with many table seats offering a rail type view. The back end of the nicely appointed restaurant has massive windows overlooking the arena’s practice rink. Hat trick - to the ushers, security and game day staff. After the horrible experience we endured at Continental Airlines Arena, and the many stories of abuse and bad behavior we’ve gleaned in conversations with others, wasn’t it nice to see arena employees greeting fans with big smiles, offering to help and providing sincere welcomes. Hat trick - Jerseys of every high school hockey team in New Jersey on display throughout the main concourse. A special touch which gives this venue its true character. Penalty - To the fans of New Jersey who have not embraced this team despite its perennial success on the ice and three Stanley Cups. Sellouts here are few and far between, and on the night we were here there were huge yawning gaps of empty seats throughout the lower bowl. Assist - Not only plenty of merchandise stores, but even an auction area displaying cool memorabilia. Assist - In one lobby is a giant puck commissioned for Opening Night. Fans in attendance that night were able to sign it, and it is now on display for posterity. Hat trick - A separate practice rink in the arena, with its own locker facilities, only the second NHL venue with such a set up (the other one being Columbus). Penalty - Upper deck seats (they call ‘em “100s”) $75 and $100, lower bowls $95 and $115 with the center ice clubs $200. Parking $25 and $20. Prepare to spend, spend, spend to attend a game here. Maybe that’s helping to keep fans away? For the record, the uppermost cheapies were packed, while the pricier seats were readily available. It is hard to find any Devils fan complaining about their new digs here in downtown Newark. Their former home, Continental Airlines Arena, was a shabby and substandard venue in a horrible location with few fan friendly amenities, surly and rude game day staff, and little intimacy as a place to watch hockey. While downtown Newark is not the sexiest location for their new venue, it is an area that is trying to find its footing for an urban comeback, and The Rock is central to that goal. This arena is a superb place to watch hockey. It is bright, comfortable, plenty of things to see and do, good stuff to eat, friendly staff, adequate game day entertainment. Oh yeah, and their hockey team seems to be pretty good year in and year out. While not breaking the NHL top five, we nonetheless give good marks in most categories and would be glad to pay a return visit. Newark, N.J. - The Devils do not plan to pay the first year's rent on the $375 million Prudential Center and instead say the Newark Housing Authority owes them nearly $800,000 due to delays in completing the arena. The authority, which owns the arena, gave the team until last Monday to make what was expected to be a multimillion-dollar rent payment, granting the team's requests for two extensions on the Sept. 30 deadline. On Tuesday, team owners delivered 12 pages of letters and calculations to the authority stating their lease allowed them to deduct nearly $2.9 million from the roughly $2.1 million rent owed and take a $210,000 credit for next year's rent, due to delays in building the year-old arena and completing construction on surrounding land. As a result, the authority owes the team $791,530, according to a letter from Gordon Lavalette, an executive vice president with the team. Mayor Cory Booker said yesterday he was "deeply disappointed." "We are confident that the Newark Housing Authority will pursue the appropriate course of action to ensure that the city and its residents receive their fair share," Booker said in a statement. Keith Kinard, executive director of the authority, said the agency plans to declare the team in default. The authority and the team will have 30 days to resolve the rent conflict or go into arbitration. "I operated in good faith, only to have mud thrown in our face," Kinard said. "They're a hockey team and they're obviously playing games." Kinard said construction delays did not interfere with the arena's operations and should not result in a discounted rent. Team owner Jeff Vanderbeek said the Devils are merely abiding by the terms of the 30-year lease. "We have fulfilled our responsibilities under the contract and we will continue to do so," he said. "This isn't a charity. This isn't a philanthropy. This is a business. So we're going about our business." The team's lease calls for a base rent of $1 million in the first year; an additional rent payment ranging from $2 million to $6 million, based on a percentage of arena revenues; and $500,000 for sports and jobs programs. Since the first lease period ran slightly more than two-thirds of a year, from Oct. 21, 2007, until July 1, the payments are pro-rated. So the team would owe $2.1 million, or slightly more than two-thirds of the $1 million base rent and $2 million minimum additional rent. But the lease also allows for steep discounts due to delays in completing the arena and the amenities around it, according to the team. According to the team, the authority owes $902,778, for the 26-day delay in getting the arena ready for the team's home opener last Oct. 27. That delay means the Devils do not need to pay the first year's base rent and can deduct $209,627 from the second year's rent, according to the team's calculations. The team also cited a January 2006 agreement between the authority and the Devils promising all work on Lafayette Street would be complete by May 1, 2006. The street work wasn't done until March 27, 2007, and because of that the team said the authority owes $20,000 a day up to a ceiling of $2 million for the delay, according to the team. The full $2 million penalty has been due since Oct. 1, 2007, according to the Devils. The authority also said that because the entrance plaza at Mulberry Street and Edison Place is still not complete, the Devils should get $177,831, according to the team. "None of these things were ever brought to our attention in countless meetings, in countless correspondence going back and forth with them. Frankly, I'm shocked," Kinard said. The Devils also owe $1 million for maintenance, although the team made no mention of that, said Bill Crawley of the Newark Downtown Core Redevelopment Corp., which oversees development around the arena. The team did commit to making payments for sports and jobs programs just under $347,000 instead of $500,000, due to the short lease period. Richard Monteilh, the city's lead negotiator when the lease was signed with the Devils under former Mayor Sharpe James, said the team were responsible for some of their own financial and construction delays. Newark, N.J. - Looking for a save that would make Devils goalie Martin Brodeur proud, Newark city officials asked the state Legislature to deflect a $6 million property tax bill they say was inadvertently assessed on the new Prudential Center. "This is not a tax break," Paul Sangillo, attorney for the Newark Housing Authority told members of the Assembly Appropriations Committee as he urged their support for a bill that would exempt the arena from the tax bill. "This is an effort to correct a technical error at the inception of the development of the arena and nothing more." Sangillo said officials who crafted the arena plan under former mayor Sharpe James bungled provisions in the development deal that were supposed to exempt the new arena from property taxes. Under terms of the agreement, the arena's owners pay Newark a portion of their concession sales, suite rentals and other revenues in lieu of property tax payments. But Sangillo said the agreement as approved fails to explicitly exempt the new arena from property taxes. Without a change in the law, he said, the Housing Authority, which owns the land where the arena is built, will have to pay Newark $6 million in property taxes in addition to passing along the revenue payments the authority receives from the arena's owners. Changing the law, he said, will not save the Devils from paying the tax bill. 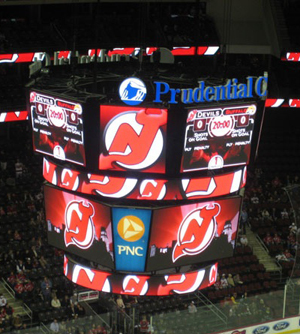 Newark, N.J. - The Devils must "immediately" pay $2.4 million in rent for the Prudential Center, the Newark Housing Authority wrote in a letter to the team. The team has defaulted on its lease by failing to pay the rent, according to the letter sent by Ellen Harris, chief legal officer at the authority, which owns the year-old arena. The team owes $700,000 in base rent, plus nearly $1.4 million in additional rent and $347,500 for community programs, according to the letter from Harris. The additional rent is based on a portion of the arena's revenues. The authority plans to audit the team's books to make sure the calculations are accurate. If the dispute is not resolved within 30 days, it will go to arbitration, and a panel chosen by the two sides will issue a decision, according to the team's lease with the authority. "We will exhaust any and all legal remedies to make sure we will receive full payment," said Keith Kinard, executive director of the authority. The authority also is considering declaring the team in default for failing to earn a final certificate of occupancy, Kinard said. The arena has a temporary certificate of occupancy and is required to post fire watch workers at all events. The Devils maintain they do not owe any rent, according to Oct. 21 letters from the team to the authority. In fact, the team argues that the authority owes nearly $800,000 in penalties due to construction delays, as well as a $210,000 credit on the following year's rent. The team will pay for sports and job training programs, but it will send the funds to the community groups running those programs, not the authority, according to the Oct. 21 correspondence. On Oct. 21, after requesting two extensions on the Sept. 30 rent deadline, the Devils informed the authority that they would deduct nearly $2.9 million from the roughly $2.1 million rent owed and take a $210,000 credit for next year's rent. The deductions were due to delays in building the year-old arena and completing construction on Lafayette Street and an entrance plaza, according to the team. The authority maintains that the Devils were responsible for some of the hold-ups, and that the delays did not interfere with the arena's operations or profits. In its first eight months, from opening day on Oct. 25, 2007, until July 1, the arena took in $30.5 million from suite sales, concessions, advertising, naming rights and other revenues, according to calculations submitted by the team to the authority. Newark, N.J. - More than a year after the Prudential Center opened in downtown Newark, the Devils and their landlord aren't the only ones haggling over unpaid bills. City officials say they're still waiting for the hockey team to pay for sewer installation and small businesses displaced by the arena, along with contractors and sub-contractors say they are also awaiting checks for services rendered. Councilman Augusto Amador said the city should take action if the Devils refuse to pay an outstanding utility bill. The Devils owe the city $41,625 for installation of sewer lines, according to the Newark Housing Authority, which owns the arena. "If they continue not to pay, I'm sure we'll consider ... shutting off the water, just like any normal business entity in the city," said Amador, a commissioner for the authority. "Enough is enough." Jeff Vanderbeek, an owner of the team, said he heard nothing about the installation fee until last week when the authority demanded payment. "We'll look into it, but that's the first I heard about it," he said. At the same time, a half-dozen businesses forced out of the arena zone by eminent domain say they are struggling to get by without reimbursement for their moving expenses. The Housing Authority and the Devils are fighting over who must pay the roughly $750,000 in relocation costs. Jorge Aguayo, whose pompom factory was forced out of the zone, is owed $292,000, his attorney, William Ward, said. Without those funds, Aguayo said he cannot overhaul his new plant in Pennsylvania to accommodate his 5-ton machines. Without the machines, he cannot create the specialized yarn he needs. And without that yarn, he said, business is on the ropes. The housing authority argues the Devils must pay the relocation costs since the city handed over $220 million to fund the construction. The city and other public agencies have also spent $85 million fixing up the area around the Prudential Center. The Devils' 2005 redevelopment agreement with the city requires the team's approval for all over-budget relocation costs. However, the Devils have repeatedly canceled meetings to discuss the bills, said Ellen Harris, the authority's chief legal officer. "There's simply no basis they've been able to articulate to us for refusing to do that, other than sheer bad faith," Harris said. Vanderbeek said some of the bills are bogus. Some former occupants - like Aguayo - have moved outside the 50-mile zone eligible for reimbursement, while others have overestimated the size of their new location or submitted bills for rent they have not paid, Vanderbeek said. "They want us to just close our eyes and make the payments - not going to happen," he said. "We're trying to help out, to save the city of Newark and the housing authority vast sums of money." Ward said the authority knew where Aguayo was going, inspected the Pennsylvania plant and approved the move. The dispute over the Devils' finances began last month, when the team announced it would not pay the $2 million to $6 million the authority expected to receive in rent. In fact, the Devils said the authority owes them nearly $800,000 this year and a $210,000 credit for next year, due to penalties for construction delays. Newark, N.J. - A new deal could position the Prudential Center in Newark as a sports venue and the Izod Center in the Meadowlands as an entertainment venue under a new plan being worked out between the owners of the two arenas. The deal reportedly would see the Nets move from the Izod Center to the Prudential Center while the Prudential Center would agree not to bid for entertainment shows sought by the Izod Center. Both facilities, which are only a few miles apart, have been bidding against each for the shows, making it difficult for either to make money. 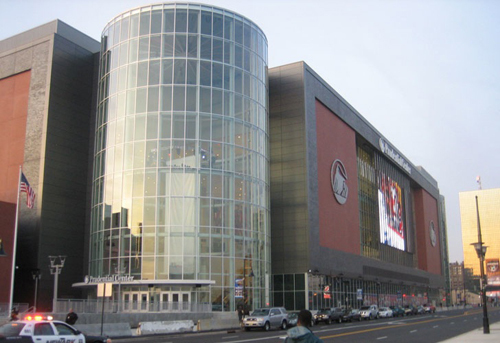 The Prudential Center is owned by the NHL New Jersey Devils while the Izod Center is owned by the New Jersey Sport and Exposition Authority. To make the deal work, the owners would create a new venture, Jersey Presents, which would schedule events and divide revenues. The venues would also levy a ticket surcharge of $1 for sports events and $3 for other events. The money would be divided between the venues under a formula still being devised. The Nets, which have been losing tens of millions of dollars a year, would avoid paying a $7.5 million penalty to the Izod Center for breaking their lease to move to Newark. They would also pay a significantly lower per-game rental fee, and earn a share of suite revenue they generate at the Prudential Center. The Devils and the Nets would also sell ticket packages together. New Jersey officials hope the move to Newark's newer arena could help keep the Nets from moving to Brooklyn in 2012. A performance clause in the proposed deal would require that the team spend minimum amounts on player salaries and marketing as long as they remain at the Prudential Center. The Nets say they are focused now on arranging financing for their Brooklyn arena. That must be in place by the end of the month or they will lose state money needed for construction. Team officials say they will consider a move to Newark after that deal is done. The agreement is also expected to please businesses around the Izod Center which have been working hard to make sure the venue doesn't close. As a rule, those who attend entertainment shows at the Izod Center tend to utilize area restaurants and other businesses more than sports fans. One other constituency may be needed to pull the plan off: the New Jersey legislature. If the new fee is added by the venues, the money becomes taxable. However, if it is ordered by the legislature, it becomes tax-free. Governor-elect Christopher Christie is opposed to the surcharge, so to avoid his veto, the legislature must act before he takes office Jan. 19. Legislators have already started arguing about the fee with some calling it a bailout for the Prudential Center and others saying it's a state subsidy for Newark. East Rutherford, N.J. - New Jersey Gov. Christopher Christie will push to fine the NBA Nets $7.5 million if the team decides to leave the Izod Center for the Prudential Center in Newark. The suggestion was included in a 20-page document issued by the New Jersey Gaming, Sports and Entertainment Committee of the governor's transition team. The report, compiled before the governor took office last week, focuses largely on the state's casinos and horse racing, both of which, the committee said, were "broken." The report identified agreements made during previous administrations that the Christie Administration hopes to revise or undo. One is a plan created last year to allow the Nets to break their lease at the Izod Center two years early and move to the Prudential Center until their new arena in Brooklyn opens. However, the committee said that the Nets "cannot leave the Meadowlands without paying the waiver amount. The impact upon suites and sponsorship dollars has to be part of the negotiations." The report did not specify how much the Nets pay to the New Jersey Sports and Exhibition Authority in suite and sponsorship revenue. But according to their Izod Center lease, they do not need to pay a penalty if they terminate their lease early because they would stay in Newark less than five years. The team would need a waiver to break its lease, however. Newark, N.J. - The Nets have completed a deal to move out of the Izod Center and into Newark's Prudential Center for two years while their new home is being built in Brooklyn. The deal has the blessing of Gov. Chris Christie. It will cost the Nets $4 million to break the lease. The plan will have the Nets and Devils playing together in the state's largest city. The move is temporary, with the Nets still planning to move to a new arena in Brooklyn by the start of the 2012 basketball season. The team reportedly sees the Prudential Center, which is operated by the Devils, as a possible new beginning for a club that has been steadily losing fan base. Two pre-season games at the Prudential Center sold well. Talks had been ongoing since last year to allow the team to move, but a major sticking point was a $7.5 million penalty the Nets faced if they broke their lease with the Sports Authority early. Although former Gov. Jon Corzine was willing to waive the fee, a proposed deal fell apart after Christie was elected and the sports and gaming committee of Christie's transition team suggested the penalty should be upheld. In recent weeks, Jon Hanson, a former chairman of the New Jersey Sports and Exposition Authority who headed that panel has been talking with the Nets, the Devils and the Sports Authority to see if an accord could be reached. Those early termination fees could be partially offset by the Nets with credits of up to $250,000 for proceeds to benefit Newark Symphony Hall, under the agreement approved by the News Jersey Sports and Exhibition Authority. It would be further offset with $100,000 in credits for the lease of suites at the Prudential Center for Nets games and general events. Advertising revenues could generate an additional $100,000 in credits against the termination fees. The agreement also contains a non-disparagement clause aimed at ending the arena wars between Izod and Prudential - which are just miles apart and compete for many of the same concerts and entertainment. It prohibits all sides - the Nets, the Sports Authority and the Prudential Center - from talking negatively about either the Izod Center or Prudential Center, or encouraging the closure of any facility. Additionally, the Nets agreed that it would not stand in the way of another NBA coming to New Jersey in the future - which leaves the door open to another team coming to the Prudential Center should the Nets move to Brooklyn. The Nets and the Devils still must come to terms over actual lease payments, and when the Nets might begin play in Newark, officials said. Newark, N.J. - The Newark Housing Authority believes the NHL Devils owe back rent on the Prudential Center of about $4 million. The agency has taken steps that could put the dispute before an arbitrator. Officials say the team has not made a payment to the authority since the venue opened in October 2007. The team says promised work around the building was not completed by an agreed - upon deadline. In a letter to the Devils, lawyers for the housing authority said that because a deal thought to be "days away" in early March had received no response, they would be taking the first in a series of steps toward arbitration if an agreement is not reached in the next few weeks. The housing authority was the developer for the project and acts as the arena's owner, but the bulk of revenue is supposed to be handed over to the city. If the matter goes to arbitration, hearings will be held before independent arbitrators, who serve as judge and jury. Both parties agree to abide by the arbitrators' decision. The "notice of dispute" caught city officials and Devils leadership off guard after many assumed the deal was all but settled. "We have been ready and willing to pay our rent for the last eight months and on numerous occasions we thought we had a deal with the city and the housing authority," Jeff Vanderbeek, Devils chairman and managing partner said. "I am very confused as to why we received this letter and furthermore, after talking to the mayor's office, they seemed equally confused as to why the letter was sent." But authority attorney Justin Walder said the Devils had delayed too long and need to move faster. "The authority has no alternative but to pursue the process set forth in the agreements with the Devils so that there can be a fair and equitable meeting of the Devils' obligations to the authority and ultimately the city," he said. 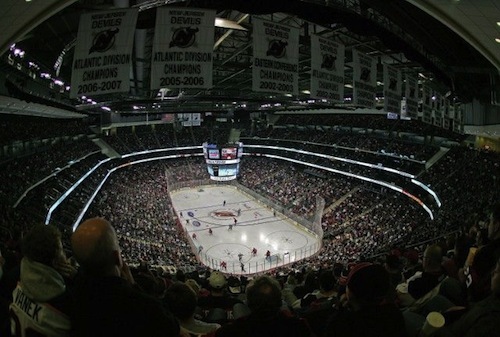 The Devils entered into a rental agreement with the Newark Housing Authority in 2005 that would require the Devils, the arena's principal tenant, to pay a base rent of roughly $2 million a year along with graduated percentages of arena revenues. The authority would then hand over the bulk of the revenue to the cash-starved city, which put up $220 million for construction of the arena. Because of the complex arrangement of the contract, officials on both sides of the dispute could not give the specific amount of money involved in the rent, but both sides say they are owed compensation. "We're talking about a substantial amount of money," Walder said. "There's a good faith relationship that has to exist between the Devils and the community." At least a half-dozen deals have been floated since 2007, many of them negotiated between Mayor Cory Booker, Vanderbeek, and Keith Kinard, director of the housing authority, When Booker announced in March the New Jersey Nets would play in the arena for at least the next two years, he and others said a deal was close. Newark, N.J. - A dispute over division of parking revenue is holding up a final agreement between Newark and the New Jersey Devils over how much money the team owes the city. A letter signed in 2005 by former Newark Housing Authority Director Harold Lucas, former city Business Administrator Richard Monteilh and Devils Chairman Jeff Vanderbeek guarantees the hockey team $2.7 million a year in parking revenue. But Mayor Cory Booker and Keith Kinard, the current housing authority director, said the agreement is not legally binding because it was not approved by authority commissioners. The Newark Housing Authority was the developer for the arena project and acts as its owner, but the bulk of revenue is supposed to be handed over to the city. Since 2008, the Devils have withheld rent - $2.5 million a year - citing construction delays, failed land acquisitions and unpaid revenue. Team owner Jeff Vanderbeek said he has waived $3.2 million in construction delay costs, forgiven $2.7 million in past parking revenue and thrown out the parking letter agreement for future payments. He also hammered out a deal that would give the city increased revenue, according to e-mails, voicemails and and text messages among Vanderbeek, the housing authority and Booker. For their part, city officials say they are looking to improve the revenue flow from the arena. Kinard has tried to negotiate a portion of a ticket tax. Under one proposal tentatively agreed upon by the Devils, the city would receive 50 cents per ticket for sporting events and $1.50 per ticket for entertainment events a thte arena. But that deal fell through after Kinard decided that instead of a flat fee, the city would rather get a percentage of the ticket price. the next two seasons, Booker and Vanderbeek said a resolution on the dispute was imminent. But by May 13, a deal still had not been struck, largely because of the ticket tax issue. Kinard sent a "notice of dispute" to the Devils, setting the legal time clock toward arbitration - a mediation by independent parties which both sides will be legally bound to follow, according to the lease agreement. Newark, N.J. - The Newark Housing Authority has filed a lawsuit against the New Jersey Devils in a dispute over money the agency says the team owes. The Devils responded by filing for arbitration on many of the same issues. 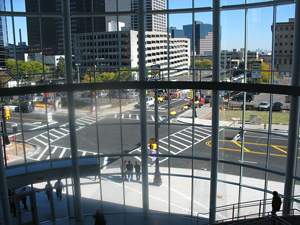 Both sides have been at odds since October 2007, when the Prudential Center opened. The city had put up $220 million for construction of the arena and entered into a complex rental agreement through the Newark Housing Authority. Under that contract, the Devils as the arena's principal tenant were to pay a base rent, along with graduated percentages of arena revenues. The Devils began have been withholding rent - $5.7 million in payments since 2008. The contention centered who was responsible for construction delay costs, failed land acquisitions, relocation expenses and parking revenues. Each time one side indicated agreement had been reached, the expected settlement fell apart. Even as late as March, when the New Jersey Nets announced they would play at the Prudential Center for the next two seasons, Newark Mayor Cory Booker and team owner Jeff Vanderbeek said a resolution on the dispute was imminent. But by May 13, a deal still had not been struck, largely because of a new issue regarding a ticket tax. City officials said they were simply looking to improve the revenue flow from the arena. The officials feel they inherited a bad deal negotiated by the prior administration, that of former Mayor Sharpe James. Vanderbeek, meanwhile, maintained the Devils had agreed to one concession after another, and each time, he said, the city wanted more. Then in May, Keith Kinard, the housing authority director, sent a "notice of dispute" to the Devils, setting the legal time clock ticking toward arbitration. The Devils over the weekend submitted a new offer to the city they said they hoped would finally lead to a resolution. They agreed to immediately pay $3.9 million in back rent after a deduction of $1.7 million in capital expenditures claimed under the lease, and a separate $346,576 payment that had been made for a jobs and youth programs. Everything else goes to arbitration. The housing authority then raised the stakes with its new lawsuit, asking a judge to declare a 2005 agreement for the share of parking revenues to be null and void. That letter guaranteed the hockey team $2.7 million a year in parking revenue. The city claims the agreement is not legally binding because it was not approved by authority commissioners. In its court filing, the city said the letter was also never ratified by the city council, nor actually signed by the housing director. 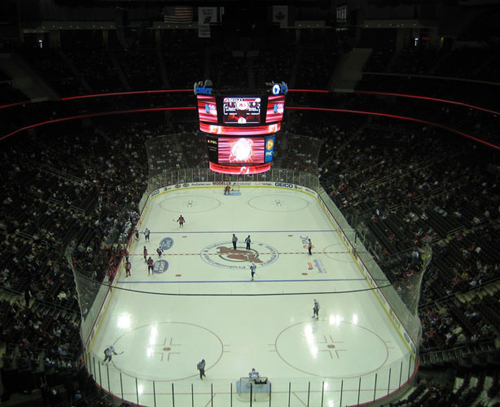 The Prudential Center of Newark surpassed the Izod Center of the Meadowlands in ticket sales for the first half of 2010, according to the Bergen Record. The report said that out of the top 100 worldwide arenas, the Prudential Center ranked 33rd - up from 65th last year - selling 148,959 tickets from Jan 1. to June 30. Meanwhile the Izod Center ranked 42nd - down from 25th last year - selling only 129,690 tickets. John Samerjan from the New Jersey Sports and Exposition Authority told the Record that if sales for Cavalia - an outdoor show held in the Izod parking lot - was counted, the Izod would beat out the Newark arena. Newark, N.J. - Newark Mayor Cory Booker is skeptical about a plan by two city council members to sell the city's share of the Prudential Center in order to raise money for the city, according to Bloomberg News. The $375 million venue, home of the New Jersey Devils National Hockey League team, is owned by the city's housing authority. It sits adjacent to City Hall, two blocks from Newark Penn Station, a major New Jersey Transit rail hub. Booker said Newark is in litigation over $3.5 million in annual lease payments from the Devils. Until that case is settled, the city can't consider a sale "in any real way," though officials may revisit the idea when the legal issues are resolved, Booker said in an interview with Bloomberg. "There has been absolutely no plan from the council or mayor's office to sell the arena," Booker said. "There's nothing formal right now, other than bouncing ideas around." Bloomberg reported that Councilor Ronald Rice said in a June letter to members of the Municipal Budget Committee that the idea is a "radical" one that could save money while bringing in an up-front payment of as much as $80 million. Luis Quintana, a former vice president of the council who has served on the nine-member body since 1994, told Bloomberg that a sale of the 18,000-seat facility might bring $200 million. The arena doesn't pay taxes or water fees, and transferring it to private ownership would allow Newark to collect both, he said. Booker has said as many as 350 police and firefighters, as well as 600 other city employees, may be fired to make up for $70 million that his $600 million budget for the calendar year counted on from the water deal. The spending plan, which Booker unveiled in June, narrowed a deficit originally estimated at $150 million. He said in July that he also plans to put city government on a four-day workweek and cut back on nonessential spending, including "everything from toilet paper to printer paper." Newark, N.J. - A court ruling expected soon could resolve a crucial sticking point in a rancorous legal battle over revenue sharing between the Prudential Arena and the city of Newark, the Newark Star Ledger reported. Newark and the Newark Housing Authority claim they are owed roughly $10 million in back rent for the hockey team's use of the Prudential Arena. The Devils say, because of delays in construction and the city's failure to deliver on a parking agreement, they are owed roughly $17 million. After numerous deals were scrapped over the last three years, the parties this summer filed separately for arbitration, a process in which an independent mediator issues a ruling that everyone is legally bound to follow. Soon thereafter, a fight erupted over what can be arbitrated. The Star Ledger said The Devils wanted expedited, 48-hour arbitration. The NHA wanted the longer version which would take several months. But in a lease agreement that is hundreds of pages long, the biggest sticking point is a two-page letter dealing with parking revenue, and about which the court will soon decide. Lawyers for the Devils say the NHA agreed in the lease to provide parking revenue from developers surrounding the three-year-old arena, but the NHA failed to carry through. Then-NHA director Harold Lucas and then-Newark business administrator Richard Monteilh drafted a letter in 2005 saying they would guarantee $2.7 million a year in parking revenue for the arena. The letter was also signed by Devils' managing partner Jeff Vanderbeek. The city and housing authority now argue the letter is not binding because it was not approved by the city council or the NHA board of commissioners. Therefore, they say, it should not be a part of the arbitration, according to documents filed with the court. The Devils say the letter was an extension of the lease and its relevance should be determined by an arbitrator, not the court. Newark, N.J. - A Newark Superior Court judge has ruled that a parking letter at the center of the dispute between Newark and the New Jersey Devils is not an enforceable contract, according to the Newark Star Ledger. The letter, signed by former Newark Housing Authority director Harold Lucas and former Newark Business Administrator Richard Monteilh, as well as Devils owner Jeff Vanderbeek, called for the city to provide the Devils with $2.7 million annually for parking. The Devils have said the letter was agreed to after the Newark Housing Authority failed to provide adequate parking revenues from developers surrounding the arena. "The parking letter simply is not an enforceable contract," Patricia Costello ruled in a written judgment, adding it "simply requires the signatories to 'meet, discuss and negotiate in good faith,'" the newspaper reported. The annual $2.7 million payment the Devils sought was one of the central reasons they have not paid much of the rent to the authority. Remaining issues in the contract will be decided by an arbitrator in the coming months. As of now, the Devils have paid more than $300,000 to the city as part of the arena deal, but the city claims $10 million is still outstanding. The Devils maintain that construction delays led to costly overruns and the city owes the team millions as a result. Amtrak said it signed a three-year deal to have the name of its high-speed train, the Acela, on an up-scale restaurant in the Prudential Center in Newark, a regular stop on the railroad's Northeast Corridor, according to the New York Times. The agreement, which is believed to be worth mid-six figures over three years, follows similar deals at Citi Field with the Mets and the Verizon Center in Washington, D.C., where the Capitals and Wizards play. 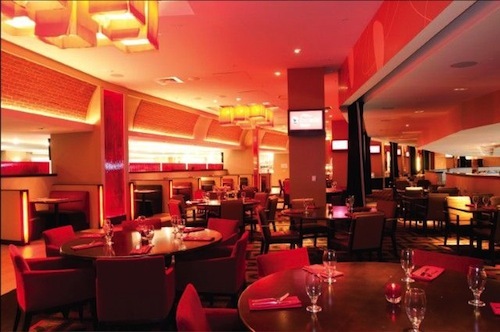 The restaurant, which has 350 seats, is located on the first of two suite levels at the arena. Newark, N.J. - The attendance-challenged, heavily indebted New Jersey Devils missed its Sept. 1 loan payment, giving its lenders a breakaway chance to push the team into bankruptcy, a source with direct knowledge of the situation told the New York Post. The team denies there is a problem. "The Devils are blowing up," the source said. 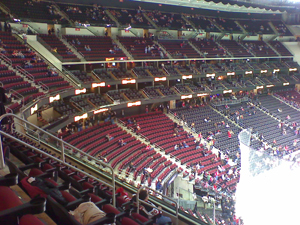 The team's financial hardships could also affect Newark's four-year-old Prudential Center, the Devils' home arena. Team-owned Devils Arena Entertainment operates the $375 million building and guarantees the Devils' loans and, therefore, is in danger of also going bankrupt, the newspaper said. Two issues are complicating matters, according to the Post. First, principal owner Jeff Vanderbeek and co-owner Ray Chambers, each of whom owns 47 percent of the franchise, are on the outs. Chambers, through his Brick City Hockey unit, has been trying to sell his non-controlling stake in the franchise for a year. The Post says Vanderbeek agreed to buy Chambers' shares, but that was not confirmed. Otherwise, the efforts of Chambers and Moag & Co., a Baltimore investment bank, have been unsuccessful, despite, a source said, cutting their asking price 20 percent to $200 million. Forbes last year estimated the Devils were worth $218 million, No. 11 in the league, down two percent from 2010. The team is ranked No. 25 in attendance. Second, Vanderbeek's relationship with the lenders is as frosty as the rink surface at The Rock, as the arena is known. If the Devils, who along with the arena operation company, owe 15 percent more than the team is worth, according to Forbes, are declared bankrupt � and one source speculates that has already happened � lenders cannot repossess the team and force a sale for at least 180 days. The Devils' past-due loan payment of roughly $100 million is owed to a CIT-led lending group. Devils Arena Entertainment owes $180 million, the source said. The financial forecast at The Rock is also stormy. While it is expected to post its first profit this year, the arena is facing a potential loss of revenue from the NBA lockout. The New Jersey Nets, who are scheduled to play their second and last season in Newark beginning next month, could be forced to cancel many games. The Post said collecting proceeds from Nets games is what makes Devils Arena Entertainment profitable, and the NBA lockout could result in The Rock losing 25 percent of its 161 dates, according to a recent Bloomberg News article. The Nets will face no financial penalty if the lockout forces them to cancel games. 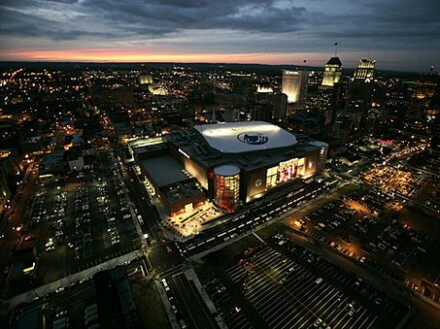 "So the facility is at risk," Richard Krezwick, the GM of the arena, told Bloomberg. Responding to the story, the Newark Star Ledger quoted its own sources as saying the deadline for the loan payment had been pushed back almost two months and an agreement to sell a 47 percent share of the NHL club to someone other than Devils chairman Jeff Vanderbeek could be completed in the next 40 to 45 days. If and when the agreement by partners Mike Gilfillan and Ray Chambers to sell their shares of Brick City LLC is approved by the NHL's board of governors, Vanderbeek will still own 47 percent of the Devils, the new owners will have a 47 percent share and Peter Simon will retain his six percent ownership stake. The Devils issued a public statement saying the Post story was wrong. "Today's NY Post story is inaccurate," the statement read. "The notions that the Devils are facing bankruptcy or that 'the Devils have told their banks to get lost' are patently untrue. The Devils value their relationship with their banks and are confident a refinancing will be completed shortly. As stated previously, ownership is close to finalizing an agreement that would lead to a buyout of Brick City's share of the company. "The organization is also pleased to report that new season ticket sales are up 130 percent over last year and last week's on-sale for single game tickets were 260 percent above last year's similar period. Finally, the start of training camp was incorrectly reported in the article as tomorrow, in fact, training camp starts on Friday for the rookies and Saturday for the veterans." NHL deputy commissioner Bill Daly would not comment to the Star Ledger about the Devils' finances, except to characterize the Post story as inaccurate while backing the team's statement via an e-mail. Newark, N.J. - Devils co-owner Ray Chambers is seeking to relinquish his stake in the NHL team as part of an exit strategy aimed to help the financially struggling franchise refinance its debt, two sources familiar with the situation told the Newark Star Ledger. An organizational source close to the negotiations told the newspaper the Brick City LLC holding company, operated by Chambers' son-in-law Michael Gilfillan, has agreed to pay off a $23 million loan to a lender as part of an arrangement that would allow Chambers, a billionaire philanthropist, to give up his 47 percent share in the team. The other main co-owner, Jeffrey Vanderbeek, still owes $23 million from the joint loan that paid for team operations, the source said. With approval by the NHL's Board of Governors, the deal would give Vanderbeek a 94 percent controlling interest in the Devils at what may be perceived as a low price. Minority owner Peter Simon would continue to own the remaining six percent of the team. "We think it's an issue that will move forward fairly quickly," one of the sources said. Both sources requested anonymity because they are not authorized to speak publicly about the arrangement. Chambers, along with Gilfillan, have owned Devils Arena Entertainment, which has operated the Prudential Center since 2004. While the Devils vehemently denied reports earlier this month that they were on the brink of bankruptcy, estimates of the team's reported debt have ranged from $170 million to $190 million. Vanderbeek will now be able to pursue financing without Chambers, who was looking to extract himself from the organization. A source said negotiations to refinance the team's debt are ongoing and there was a timetable for Chambers to withdraw himself from the process. The sources said it is possible a deal with lenders could be in place in one month, with Chambers' departure from the organization. In June, the Devils acknowledged that Chambers was in discussions with Vanderbeek to sell his share of the team as reports surfaced that the co-owners clashed on the direction and vision of the team. "(Chambers) is not really paying Jeff to get out," the source said. "He's paying off a note to get away and let Jeff take on the refinancing." Chambers' interest in the Devils, according to some in the organization, has been more about the development of Newark than profiteering. But with the team's financial struggles and with an NBA lockout threatening the 2011-12 season and revenue from Nets games, Devils Arena Entertainment is facing the possibility of greater losses. "When Ray initially got involved, it wasn't to run a sports franchise, it was for Newark's continued revitalization, to get an arena built and a team there," a source told the Star Ledger. "Jeff was more involved in what happened on the ice. "Ray thinks it's stabilized, so why not let the guy who knows the most about hockey move it forward?" Newark, N.J. - A panel of three independent arbitrators handed down a split decision in a financial dispute that the Newark Star Ledger said decidedly favors the Devils. The city, with the Newark Housing Authority acting as the arena developer, was awarded roughly $14.7 million in back rent, relocation expenses and fines. But the Devils were awarded $15.3 million in unpaid parking revenue, capital costs and excess taxes. Both amounts are due in 30 days, barring further legal action, according to the decision both sides have to honor for the remainder of the 30-year lease. "We are pleased that, finally, there is clarity to what has been a long process. The three arbitrators must be commended for their diligent and thoughtful work in bringing this matter to a close," the Devils said in a statement. "Now, for the first time, we can put this matter behind us and work closely with the city and housing authority in ensuring Newark and the Rock succeed beyond all expectations." But the city did not have as rosy an outlook. "We are deeply disappointed with today's ruling," Anne Torres, a City Hall spokeswoman, said in a statement. "The administration and the Newark Housing Authority have consistently asserted the basic inequity and unfairness of the lease agreement entered into by the prior administration with the Devils. Today's arbitration decision gives further support to this position." In the future, Newark will have to pay $2.7 million a year to the Devils in parking revenue, practically neutralizing the average $3 million in annual rent payments owed to the city over the past four years. Eventually the city's rent could reach up to $6 million a year, but the decision provides no immediate relief for strapped city coffers, the newspaper said. Mayor Cory Booker has been critical of the deal signed by former Mayor Sharpe James' administration, but subsequent opportunities by Booker's administration to renegotiate have been fruitless. Newark, N.J. - The feud between the Devils and Newark grew this week as police reduced their presence around the arena, according to the Newark Star Ledger. The battle started with an arbitrators' decision over rent and parking revenues that the newspaper said went seriously bad for the city of Newark. Mayor Cory Booker responded the next day by calling Devils managing partner Jeff Vanderbeek a "highfalutin huckster and hustler." Then the mayor claimed he was denied tickets to Bruce Springsteen's sold-out performance next month at the Devils home, the Prudential Center - a conversation the Devils say never happened, but may be moot in any case because the mayor has pledged never to set foot in the place again until the team resolves its difference with the city. The latest chapter, was when Newark has decided to reduce its police presence around the downtown arena near Penn Station that is home to the NHL team. "Obviously I'm not going to deny that the timing looks like a reaction (to the arbitration ruling)," he said. However, Booker claimed the decision has been a long time coming. "It's gone from 20 to 14 uniformed officers," Booker said in a later statement. "There are still plain clothes officers and homeland security personnel." According to the mayor, the city was faced with a need for more police in the neighborhoods and reached the conclusion that it could do with a smaller presence at the Prudential Center, which has counted nearly 8 million visitors since it opened in 2007. Police Director Samuel DeMaio said the move was not connected to the Booker-Vanderbeek feud, and that a slew of retirements forced him to rearrange officers. DeMaio suggests Vanderbeek hire extra officers for event security. Booker just as quickly added a dig at the Devils, doing nothing to change the perception that the decision to pull the police was anything other than payback. "It would be nice to have more revenue from the arena so we could have hired more cops," the mayor said. "We believe that the Devils should be stepping up like other arenas in the region to provide security for their fans." DeMaio did say the size of the force would be increased when the Devils, who begin the Stanley Cup playoffs on the road Friday, play their first home game next Tuesday. "Pru may need to start hiring us through outside employment unit like the Red Bulls stadium does with us for soccer games and events," he said. Newark says it has spent $10.8 million on police protection for the arena since 2007. Booker insisted that the arena was one of the safest parts of the city and until now, Newark has gone above and beyond what is practiced in other area arenas. "There are still police out there as well as security cameras and there should be no danger to fans coming to the arena whatsoever."